For other uses, see Samantabhadra (disambiguation). Samantabhadra (Sanskrit, "Universal Worthy") is a bodhisattva in Mahayana Buddhism associated with practice and meditation. Together with Gautama Buddha and his fellow bodhisattva Mañjuśrī, he forms the Shakyamuni trinity in Buddhism. He is the patron of the Lotus Sutra and, according to the Avatamsaka Sutra, made the ten great vows which are the basis of a bodhisattva. In China, Samantabhadra is associated with action, whereas Mañjuśrī is associated with prajñā. In Japan, this bodhisattva is often venerated by the Tendai and in Shingon Buddhism, and as the protector of the Lotus Sutra by Nichiren Buddhism. In the Nyingma school of Tibetan Buddhism, Samantabhadra is also the name of the Adi-Buddha – in indivisible Yab-Yum with his consort, Samantabhadrī. 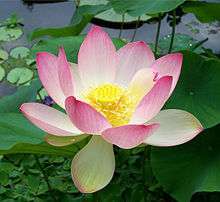 In the Lotus Sūtra, Samantabhadra is described at length in the epilogue, called the Samantabhadra Meditation Sutra (Chinese: 觀普賢菩薩行法經; pinyin: Guān Pǔxián Púsà Xíngfǎ Jīng), with special detail given to visualization of the bodhisattva, and the virtues of devotion to him. Samantabhadra is also a key figure in the Āvataṃsaka-sūtra, particularly the last chapter, the Gaṇḍavyūha-sūtra. In the climax of the Gaṇḍavyūha-sūtra, the student Sudhana meets Samantabhadra Bodhisattva, who teaches him that wisdom only exists for the sake of putting it into practice; that it is only good insofar as it benefits all living beings. To praise the Thus Come One-Tathagata. To repent misdeeds and evil karmas. To rejoice in others' merits and virtues. To request the Buddhas to continue teaching. To request the Buddhas to remain in the world. To follow the teachings of the Buddhas at all times. To accommodate and benefit all living beings. To transfer all merits and virtues to benefit all beings. The ten vows have become a common practice in East Asian Buddhism, particularly the tenth vow, with many Buddhists traditionally dedicating their merit and good works to all beings during Buddhist liturgies. Known as Pǔxián in Chinese, he is sometimes shown in Chinese art with feminine characteristics, riding an elephant with six pairs of tusks while carrying a lotus leaf 'parasol' (Sanskrit: chhatra), bearing similar dress and features to some feminine depictions of Kuan Yin. 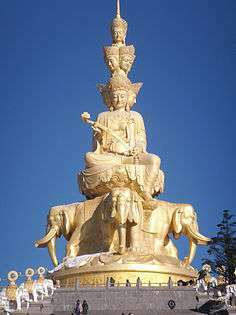 It is in this guise that Samantabhadra is revered as the patron bodhisattva of the monasteries associated with Mount Emei in western China. Some believe that the white elephant mount of Samantabhadra was the same elephant that appeared to Queen Maya, the mother of the Buddha, to herald his birth. 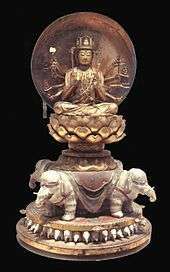 Mahayana esoteric traditions treat Samantabhada as one of the 'Primordial' (Sanskrit: Dharmakaya) Buddhas, but the main primordial buddha is considered to be Vairocana. 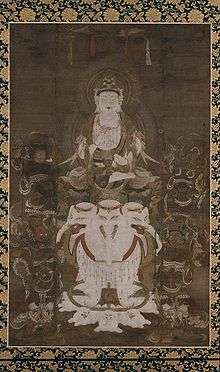 Samantabhadra, pictured in Bodhisattva of Universal Virtue who Prolongs Life, 12th century painting on silk, late Heian period. 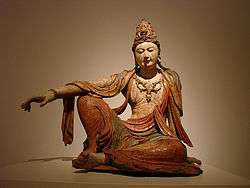 It is very common that the bodhisattva of the Mahayana tradition with the name of Samantabhadra is conflated with a Buddha with the same name that appears as the primordial buddha, in some of the Tibetan traditions. This comes from the fact that both figures have the same name but their meaning within their respective traditions is quite different. It is not the case that the bodhisattva of the Mahayana has evolved or transformed when assimilated into the Tibetan tradition because in that tradition the Bodhisattva Samantabhadra is present and the Dharmakaya Samantabhadra as well as two separate and distinct entities. In the Tibetan Buddhist tradition, particularly the Nyingma school, Dharmakaya Samantabhadra (not the bodhisattva of the Mahayana) is considered the most primordial Buddha, akin in status to Vajradhara for the Sarma traditions. Samantabhadra appears in the Vajrayana tantric text the Kunjed Gyalpo Tantra, as the Primordial Buddha, the 'embodiment' (Sanskrit: kaya) or 'field' (Sanskrit: kṣetra) of 'timeless awareness, gnosis' (Sanskrit: jñāna) awakened since before the very beginning. Therefore, in Tibetan Buddhism the Nyingma, or 'Old Translation' school, the Sakya and the Bön schools view Samantabhadra as the Primordial Buddha. In the Nyingma school of Tibetan Buddhist Vajrayana, Samantabhadra is considered a primordial Buddha in indivisible yab-yum union with his consort Samantabhadri. However, the Kagyu and Gelug schools use Vajradhara to represent the Primordial Buddha. Samantabhadra is not subject to limits of time, place, or physical conditions. Samantabhadra is not a colored being with two eyes, etc. Samantabhadra is the unity of awareness and emptiness, the unity of appearances and emptiness, the nature of mind, natural clarity with unceasing compassion - that is Samantabhadra from the very beginning. 'The Mirror of the Mind of Samantabhadra' (Tibetan: ཀུན་ཏུ་བཟང་པོ་ཐུགས་ཀྱི་མེ་ལོང, Wylie: kun tu bzang po thugs kyi me long ) is one of the Seventeen Tantras of Dzogchen Upadesha. Fugen Enmei (普賢延命菩薩), the life Preserver. Sri Lankan people venerates Samantabhadra Bodhisatva as Saman (also called Sumana, Samantha, Sumana Saman, Sinhalese: සුමන සමන් ‍දෙවි). The name Saman means "the rising morning sun". God Saman is considered one of the guardian deities of the island and Buddhism. His main shrine is located in Ratnapura, where there is an annual festival held in his honor. ↑ Katō Bunno, Tamura Yoshirō, Miyasaka Kōjirō, tr. (1975), The Threefold Lotus Sutra : The Sutra of Innumerable Meanings; The Sutra of the Lotus Flower of the Wonderful Law; The Sutra of Meditation on the Bodhisattva Universal Virtue. New York & Tōkyō: Weatherhill & Kōsei Publishing. ↑ "The Gods & Deity Worship in Sri Lanka". Retrieved 2010-06-28. Wikimedia Commons has media related to Samantabhadra. Yeshe De Project (1986). Ancient Tibet: Research materials from the Yeshe De Project. California: Dharma Publishing. ISBN 0-89800-146-3. Dudjom Rinpoche; Jikdrel Yeshe Dorje (1991). Translated and edited by Gyurme Dorje with Matthew Kapstein, ed. The Nyingma School of Tibetan Buddhism: its Fundamentals and History. Two Volumes. Boston: Wisdom Publications. ISBN 0-86171-087-8.